Exciting news when SCU signed Lydia Dawson. They were eager to get her booked immediately, and what better way to see what she’s got than to take on a real wrestling surgeon? Er, “The Nurse” Cindy Warren? We will see if Lydia is as amazing as her reputation, or if she will be put to sleep by Cindy. Mark Cross has a win under his belt, and has been very vocal about his arrival to SCU. General Manager Tad Ezra wants to test his skills as he takes on Teddy Warren-Steele. This could be a major turning point in both men’s careers, as they both have something to prove on their way to the top. Big news struck SCU when it was announced that Daniela V. Rodgers got called up to the main roster due to her strong efforts in SCW’s Blast From the Past, leaving her brother Vector C Rodgers on his own. He kicks it off as he takes to singles action. On the other side of the ring? 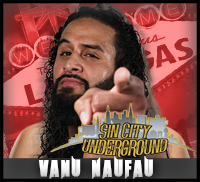 Hometown guy, Vanu Naufau. 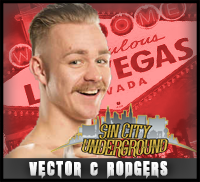 Will he make his hometown proud, or will Vector get a much needed singles victory? A match that, on any other night, could easily be the Main Event. Combat Champion, Kelli Torres will compete in wrestling action tonight as she looks to prove just how versatile she is. She has her work cut out for her as she takes on the highly impressive Effie Bingham, who has yet to lose a match in SCU. Throw in the SCU debut of Ella Singleton, and the return of Jennifer Williams, and you have a real fireworks show. OOC Note: There will be a minimum of 4 teams involved in this, selected at random if we do not reach 4 volunteer teams. If you would like to take part, please PM the underground account to let us know, and please also send in a segment to increase your chances of winning. Angel of Filth vs Shannon Middlebrooks. GM Tad wanted to give Shannon another week off before defending her title. However it was announced weeks ago that Shannon will put the title on the line. While cards will forever be subject to change. Donna has stepped in and added the match anyways. When asked why she had this to say. Cards are always subject to change but the Tongan people have spoken and they want what was advertised. Normally I would say tough cookies to those not getting the card promised but... Well for the safety of everyone in SCU, I think it's best to give them what was promised. The last thing I want is for a bunch of drunk men that happen to be body builders causing a riot to the point that someone gets injured or SCU not being allowed back in the great country. This match will go on and the people of Tonga will get the main event.